We have 4 squads aligned with the NYAA Youth Football teams. Squads will be determined by ages. Girls may be moved to a squad based on participation numbers. Starting on August 6th, practices will be held on Tuesday & Thursday evenings from 6:00pm to 7:00pm (for ALL squads). 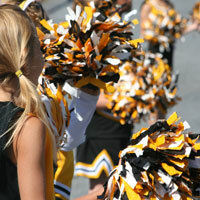 Tiny Tigers & Tigerettes will go to one day a week practices once school starts. Jr. Tigers & Tigers will remain Tuesday & Thursday evenings from 6:00pm to 7:00pm once school starts. Practices will be held on the Northwestern Lehigh Campus. Squads will learn cheers and a dance routine based on skill levels. Uniforms are supplied to the girls, however; additional items such as shoes, socks, bloomers and turtlenecks will be required. Some items can be purchased through fundraising. Football games are on Saturdays or Sundays from September to early November with a mix of home and away games. Directions to venues for games can be found here!